“These guys have the friendliest staff I have ever worked with. They completed everything not only quickly but with great quality as well. Jed in customer service walked me through everything I needed step by step. Wade called to suggest changes to make my menu even better than before and business has never been better since starting with Online Orders Now!! Definite 5 stars.” – Michael K.
Online Orders Now exists to help restaurants transform the process of online ordering into an experience. We offer an advanced restaurant online order system that has been designed to be easy to use, and even easier to start reaping the rewards from. Since 2006, we’ve offered restaurants the chance to work with the most profitable restaurant online ordering software. Restaurants of all kinds that learn how they can take advantage of our mobile web apps, catering menus, mobile menus, and website design, by and large have become dramatically more profitable. Below, we’ll take a look at what you can expect in terms of ROI and profitability while using our online ordering system for restaurants. 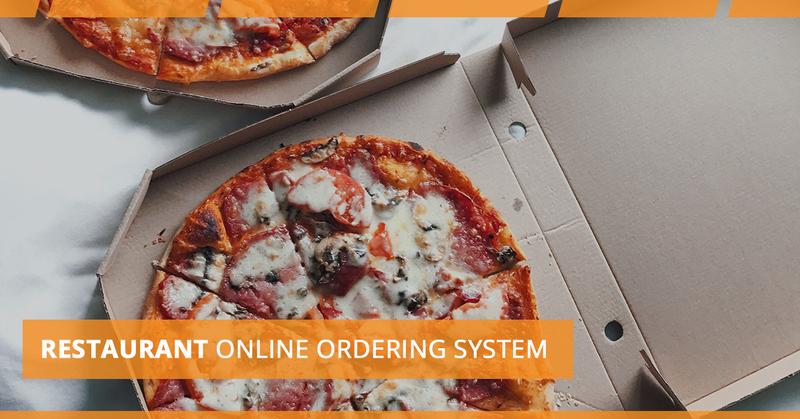 But before we highlight our individual services, products, and their features, allow us to explain a little bit more about ourselves at Online Orders Now so that you can become more familiar with the top provider of restaurant online ordering systems on the market! Online Orders Now is now exceptional. Not that we always weren’t, in our humble opinion, but our current suite of features includes advanced delivery mapping, intuitive ordering interfaces, complete integration with your POS, and $20,000 additional revenue guarantee! Again, we’ll talk more about these features later on — we just wanted to make sure you keep them top of mind while we discuss a bit of (recent) history with regards to the world of online food ordering systems. The long and the short of our story is that who we are hasn’t changed too much; we’ve proven to be consistent leaders of the pack for the past decade. And while we understand that we might be running the risk of tooting the proverbial horn here, we simply want our prospective clients to understand the longstanding quality of Online Orders Now. There is a lot to like about choosing us to be the provider of your restaurant online ordering system, and perhaps chief among them is the fact that we’ve been an established technological leader in our field for more than ten years. The proof is in the pudding, as they say. In this case, if the pudding is leading the race to help restaurants improve their online food ordering systems, our proof would include the fact that we were the first provider to offer seamless Point-of-Sale integration, phone number-based ordering, and even polygonal delivery mapping. And while a lot has happened over the last decade in terms of improved digital technology and functionality, making these features seem more like “standard issue” than pioneering, our point is that we are leading the pack in terms of innovation intended to impact the bottom line of our clients. At the end of the day, it’s about adding a stable revenue stream in which you can have confidence. Today, we remain ahead of the competition, offering new features like seamless loyalty integration, which are responsive pages that adapt based on the consumer’s device, affordable pricing, without forgetting about our ability to include payment integration with each major payment gateway in the market. We want our clients to be just as excited as we are about the many benefits that come with our restaurant online ordering software. But at the end of the day, you want to go with a company that you can trust provides consistent value. To that end, from top to bottom at our company, we have a passion for what we do. Not only do we care about being innovators in our industry, but it’s about making the lives of our customers better. When we can impact hundreds and thousands of restaurants across the country, we can make a difference in the experience of restaurant customers everywhere while making a host of restaurants much more profitable. That’s what helps us get up in the morning and love what we do. With a dedication to providing exceptional customer service that surpasses expectations, we are equipped to solve any problem that might arise. We’ve noticed that people tend to choose us for our sophisticated online food ordering system and its wealth of features, but they end up staying for both our high-quality products and our commitment to meet the unique needs of our clients. No two restaurants are alike, and we’ll work hard to make sure that everything we do speaks to your demographic while representing your brand in a way that’s completely satisfactory. Generally speaking, we have restaurant online ordering software that is easily integrated with most restaurant’s internal operations. Our online ordering system helps restaurateurs get quick yet sustainable results. Being able to see close to instantaneous results, along with better market penetration and average sale ticket amounts while lowering net costs all come together to help your business thrive. The less you have to worry about your customers’ ordering experience, and the less time you have to spend taking their phone calls for to-go orders, the more time you’ll have to get back to what you should be doing — managing your restaurant! Below you’ll find an outline of each product we offer at Online Orders Now. Naturally, we’ll lead things off with our restaurant online ordering system. If you are looking for an online food ordering system for restaurants that has more features than you could ever dream of, you’ve come to the right place at Online Orders Now. Later on we will provide a full list of features and benefits, but the essential features include first-time customers getting emailed, external delivery service email and fax notification, administration back end, and the capacity for unlimited transactions. First-Time Customers Emailed – Whenever you receive a new customer who orders from your restaurant online, you’ll get automatically emailed by our system so that you can give them whatever special attention you’d like to. External Delivery Service – We close the loop regarding paper trails between your restaurant and whatever third-party company you can use for deliveries. We’ll automatically send that company a copy of the delivery order by fax or email to ensure that everyone is kept in the loop. Administration Back-End – Our online ordering system for restaurants is full-service, meaning our customers are provided with self-sufficient products and services. Again, this leaves owners more time to spend on the floor rather than in the backroom worrying about website or mobile food ordering issues. That being said, not each restaurant manager is alike, and some owners prefer to be more hands-on in their approach. So if you are of the latter ilk, we can set you up with an easy-to-use administrative web interface in which you can make real-time changes to pieces of the puzzle like delivery times, pricing, holidays, item descriptions, business hours, and beyond! Unlimited Transactions – No matter how many total online orders you receive each month, you’ll play the same affordable, monthly, flat rate with Online Orders Now. We are upfront about our pricing (don’t worry, we’ll get there), meaning we won’t include any hidden fees based on volume or any other metric. You get what you pay for with our restaurant food ordering software. One of the most-appreciated aspects of our online ordering system is that we can fully integrate with almost all commonly used POS systems found in restaurants. We are quite familiar with POS system providers like Microsale, rPower, Maitre’D 7 & 8, and Aldelo, giving you one less thing to worry about. But even if your place of business doesn’t use one the aforementioned providers, you can simply contact us to see if we are able to integrate with whatever setup you currently have in place. While full integration is recommended for obvious reasons, we work with many clients who do not integrate their online ordering software with their POS system. If that describes your situation, we are still able to deliver orders to your restaurant through a fax machine or a connected printer. As you’ve no doubt already been able to discern, we are far from your typical restaurant food ordering system provider. Maybe you’ve been doing research on various providers for sometime, or perhaps you are just beginning to familiarize yourself with the world of restaurant websites and online ordering systems. But whichever camp describes you best, there’s a safe bet that you are in need of a website redesign. Unless you’ve had one in the past year or two, it’s likely time to take advantage of the full suite of features Online Orders Now can offer. Think of it like this: websites are similar to cars in the sense that the landscape of what is available has improved so much in the past few years that keeping your old, out-of-touch HTML-based website is akin to driving a Model-T on the autobahn while getting passed up by BMWs and the like. Seriously, that’s how much things have changed in the past half-decade or so. If you don’t have a mobile-responsive, dynamic website to capture user’s interest, not only does it reflect poorly on your brand, but search engines like Google and Bing will actively penalize you for slow load times and other dated aspects of your site. Search Engine Optimization – We have a staff of in-house SEO experts who are equipped to correctly orient your site so that all the major search engines find your website fully optimized. When our SEO experts set your website up for success, that means it will be correctly indexed by Google and Bing so that your restaurant’s listing populates on the search engine results page when folks are searching for a bite to eat in your area. This organic traffic is essentially free traffic — you don’t have to pay when someone clicks your listing like you might with paid search, or search engine marketing! The more free traffic you can get on your site, the better! Social Networking Links – In every website that has been designed in the past few years, it’s quite likely that you’ll see a minimum of one social media account linked to the website. This does a few things. For one, it lets your potential patrons know that you are up-to-date with the digital world at large, simply because you have social media accounts in the first place. Secondly, it lets your guests find reviews and make sure that your restaurant is worth giving a try. At Online Orders Now, we’ll make sure that your Facebook Twitter, Yelp, Foursquare, or any other social media account you might have will be easy to find with prominent links in the footer of your site. Contact Form – It’s essential to have a way for customers to be able to reach out to you so that they can ask questions, provide feedback, and generally engage with your brand. If you don’t have a contact form on your site, it tells your customers that you don’t care about them as much as your competition might. So while it might not seem like a fundamental aspect of running your restaurant, it’s part-in-parcel to being a business owner in the 21st-century! Google Map Widget – It’s not a revolutionary thought to say that your customers will need to be able to find your restaurant if they want to dine-in. While most people use Google Maps’ application to get around these days, it certainly doesn’t hurt to have an integrated Google Map so your customers can conveniently find out where you are located while staying on your website. The bottom line is that the more intuitive and simple of a process you can make finding your restaurant’s location, the more likely they’ll come in and spend their hard-earned tender there! Image Slider – Image sliders have become more and more common in the past few years, and for good reason. If you are able to capture the essence of your restaurant through high-quality imagery, it will quickly change your prospective customer’s state of mind from being in consideration-mode to “I’m hungry now and ready to buy-mode,” if there is such a thing. You are also able to showcase whatever strengths your restaurant has, be it your establishment’s interior, smiling guests, a happy staff, or whatever you’d like to shine the spotlight on to set your restaurant apart from the rest! Embedded Videos – If you have a few videos hosted on Youtube or Vimeo, we can feature them on a dedicated page or as part of another. Not only will customers like to see dynamic content such as this, but search engines will show favor to pages with videos on them, so it’s a win-win! At the end of the day, we know what we are doing when it comes to designing websites for restaurants of all kinds. We’ll capture the essence of your brand while giving your business the tune-up it needs to be competitive in your area. Need a mobile ordering app for your restaurant? We’ve got all of your food ordering app for restaurant needs covered. Online Orders Now will build you a custom mobile web app with your restaurant’s theme included! You’ll get all the same features that we listed regarding our custom website design, from dynamic image sliders to an integrated Google Map widget to social media badges and links — it’s all included! Our priority is to show what makes your restaurant so special. You might think that something like “mobile ordering for restaurants” is pretty much the same thing as what we’ve been describing above. And you’d be right to think so! You see, what we do here at Online Orders Now is make sure that your customers have the ability to order from their mobile devices. This matters because customers are browsing the world wide web with their phones more often than with any other device. IDC reports that in the present day, some 87 percent of connected devices-sales are completed using either a smartphone or a tablet! Clearly, it’s a space where you need to be involved. Online Orders Now provides mobile ordering systems that are sophisticated enough to offer the best ordering experience that customers can have. We utilize advanced frameworks to bring your brand a mobile-friendly format, complete with fast load times and a bandwidth-friendly format. All of this translates to customers easily ordering from your mobile site custom restaurant ordering app. It’s often the case that our clients offer a supplemental catering service in addition to their bread-and-butter offerings. Although it’s a pretty great way to spread the word about how delicious your food is (to large groups of people at that), the process of providing a catering service comes with unique challenges restaurateurs should be aware of. Luckily for our clients, we take care of as much as we can, offering a specialized catering menu that offers customized pricing, items, and quantities. What’s more, you can customize your catering service area in the case that it varies from your delivery range. Another feature of our restaurant menu app is that it lets in-person customers have the ability to browse a physical edition of your menu prior to ordering. Our DPM, or dynamic printable menu, allows your prospective guests to get physical access to your recent menu. We bring this up because some folks still prefer a tangible feel of a menu. And while most of the competition might provide the ability to print a PDF of your website’s menu, ours automatically synchronizes with any changes you’ve made — be them updates to your specials, hours, prices, or otherwise. Lower cost- While some companies might charge 20 percent on each, we have flat, monthly fees. Non-exclusivity – You can use a wide variety of food delivery systems without needing to worry about us stepping on your toes. We are here to help you make money. It’s that simple. Below you’ll find a few of the most practically beneficial features we’ve included in our online ordering software. Keep in mind that, somehow, we offer more benefits than those that are listed below. But if you feel especially inclined to do your due-diligence, you can find a comprehensive list of features by clicking on the link provided. POS Integration – We’ve mentioned it a few times above, but we’ll continue to highlight this fact: Online Orders Now offers a seamless integration between your mobile food ordering system and your Point-Of-Sale system. We’ll put each order into your POS and print out the ticket while the customer is still online. It’s the equivalent of having a digital cashier — one who requires no tips and never makes a mistake! “My Way” 30-Second Ordering – When people talk about what they love about Online Orders Now (yes, the rumors are true, we get hundreds of love letters a day), one of the aspects folks find to be the most valuable is that our software has the capacity to save how each item was ordered — including modifications. This means that every time a customer goes back to a menu item they’ve ordered before, they can select “edit” or “add to cart.” People like convenient options, and this certainly falls into that category. Order Accuracy – A beautiful aspect of our mobile ordering system is that customers can take as little or as much time as they need to fill out their orders. Plus, they are able to personally verify their order’s accuracy, which means your restaurant won’t need to worry about being blamed (correctly or not) for inaccurate orders. Our restaurant food ordering system lets online orders go directly to fax/text/email notification so that you won’t miss an order even if the internet or your POS goes down! 30 Percent Larger Tickets – Research has shown that customers who complete their order online have a ticket size that is an average of 30 percent larger than what they might order over the counter. In large part, this is likely due to the fact that customers feel more at ease when they are ordering online — they aren’t in a novel environment, there aren’t people in line behind them passively indicating for them to hurry up — it’s not too hard to imagine why. When folks order from the comfort of their home using our mobile food ordering system, they can take their time browsing the desserts, appetizers, or maybe even some restaurant apparel if they like your food and service enough! Ultimately, 30 percent larger tickets is nothing at which anyone should be turning their nose up. Marketing Data – We’ve oriented our restaurant online ordering software to ensure that the customer needs to provide their name, address, and zip code in order to be able to complete an order. Such marketing data is invaluable for restaurants who are looking to promote their brand through email marketing campaigns and the like. If you choose to integrate our system with your POS, customer data is automatically sent and stored in your POS system with every order. TIPS Functionality – Customers are able to tip directly from the food ordering system’s menu. That’s nice, but what’s nicer is the fact that you are able to default the tip to 15 percent in order level-set expectations for your guests, while at the same time making sure that the customer is able to freely choose whichever tip percentage they are most comfortable with. Discounts, Combos, Special Offers, And Packages – We give you the keys to the kingdom when it comes to setting your discounts, combos, and other special offers. Whether you prefer a percentage or a dollar amount off a regular price or order total, you can customize it as you see fit. Whether you want to require a minimum dollar figure to qualify or to function at certain times of the day or week, we’ve got you covered. Concerning packages, you can control what kind of pop-up box promotions that show up to inform the customer of any specials you may have running. Other Features – Like we said, there are plenty of other features that we haven’t had time to highlight. Among them are coupon, “pay later”, and advanced ordering functionality. In case you are wondering “advanced ordering” refers to the ability of customers to choose when they want their order to be ready for pick-up. That way, they’ll always get it when it’s piping hot, and they can order their food at any point in the day! Online Orders Now and our restaurant online ordering system provides non-integration, semi-integration, and complete-integration options. While you can find our comprehensive list of options and POS partners by clicking on the link above, you can find a few reasons below. The long and the short of it is that we make it easy for our clients to use our products, irrespective of what kind of POS (or lack thereof) you might have. We don’t want you to have to turn your internal processes upside-down just to take advantage of our online ordering system — so you don’t have to! All orders get sent to email and admin backup. If your internet goes down for some reason, you can rest easy knowing that we provide unlimited fax backup and text notifications. No matter which package you choose (see below), this is included. Credit card orders go directly to your preferred merchant processor. We will send all orders to your email for confirmation. Pricing is based on your type of integration! Give us a call at 813-549-7010 x1 to discuss all of our different options. As the graph below illustrates, our clients tend to have serious growth when they come on board with us. 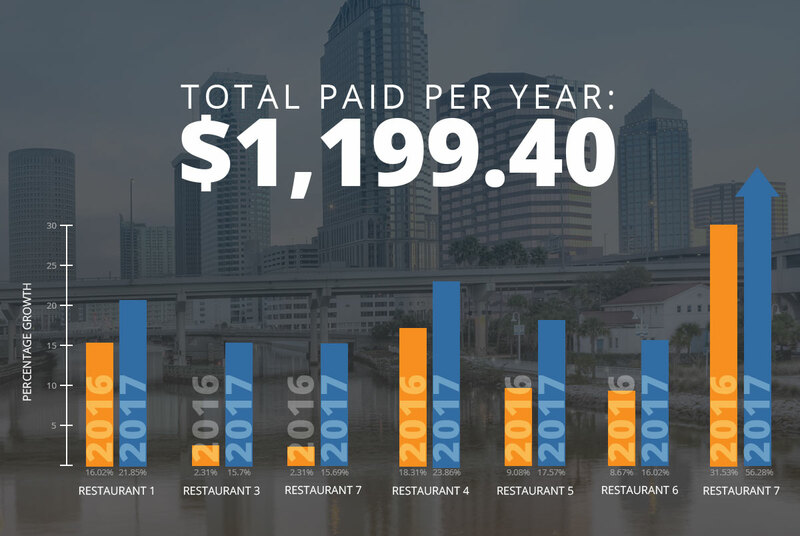 We aren’t going to say that every single client of ours will experience the same kind of growth as “Restaurant 3,” for example, we will say that the year-over-year revenue growth that these randomly-selected restaurants have disclosed showcases the general impact our restaurant online ordering system usually has. At the end of the day, your restaurant needs to adapt to the needs and wants of the modern consumer. The past decade has seen more change in the restaurant industry than perhaps ever before. That’s why finding a food ordering system is essential for your business to thrive. With a $20,000 Additional Revenue Guarantee and so many more benefits, choosing OON just makes sense. Schedule your free demo today — what do you have to lose besides the revenue you’re leaving on the table?